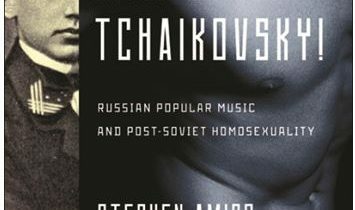 The modern LGBT rights movement and its activists of all genders have produced a substantial body of published and unpublished literature of many types ranging from biographies to historical accounts and new theoretical frameworks for the researching of sexuality. It has also brought to a wide audience certain symbols and images, some, such as the pink triangle, drawn from specific historical periods of oppression and reclaimed for affirmative purposes, while others such as the rainbow flag are more contemporary creations that have become widely applied. The most spectacular example of this latter category is unquestionably the NAMES Project AIDS Memorial Quilt, born in the early years of the pandemic in the city of San Francisco. While images of its displays at various venues including the National Mall in Washington, D.C. are instantly recognizable, less known is the variety of documentation that has been created in various formats from printed matter to the performance stage to tell the story of the Quilt and the lives whose legacies it preserves. The idea for the Quilt originated with San Francisco activist Cleve Jones, who, as part of a candlelight march in memory of assassinated Supervisor Harvey Milk and Mayor George Moscone in 1985, asked people who had lost someone to AIDS to make a sign with whatever decoration seemed appropriate and carry them during the march. After the march was completed, Jones and his fellow marchers taped the signs to the wall of the San Francisco Federal Building. The resulting image gave rise to the idea of continuing this type of memorial in the more permanent form of a traditional patchwork quilt, each of whose squares would be a unique creation of men and women who wished to signify to the world that the life of the named person had been one of worth and value. In June 1987, Cleve Jones and Mike Smith gathered a group of people at a storefront on Market Street to formally create The NAMES Project Foundation. 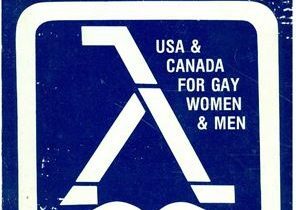 The idea was quickly picked up by the American gay and lesbian community in those cities which had at that time been heavily impacted by the AIDS pandemic- Atlanta, New York City, and Los Angeles in addition to San Francisco. Quilt panels began to arrive at the Project, and on June 27, 1987, the first forty panels of the Quilt- each the size of a human grave- were displayed from the Mayor’s balcony at San Francisco’s City Hall. By the time the Quilt was displayed on the National Mall in Washington, D.C. four months later, the number of panels had grown to 1,920. In the spring of 1988, the Quilt began a nationwide tour that would reach twenty cities and see its size expand to over six thousand panels. It returned to Washington, D.C. in October 1988, when 8, 288 panels were displayed on the Ellipse in front of the White House. The first publications and films about the Quilt appeared at this time. 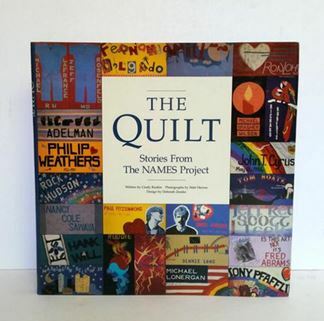 New York’s Pocket Books published Cindy Ruskin and Matt Herron’s The Quilt: Stories from the NAMES Project, composed of text and accompanying color photographs, in 1988, at a time when the only publicity about what the Project was doing was limited to newspaper articles and television coverage. The color and diversity of the Quilt made it a natural subject for filming, and several productions appeared in 1988 and 1989 to augment the documentation of this unique creation. The first was a short piece produced by the NAMES Project Foundation itself, We Bring a Quilt, with the subject focus the October 1988 display on the Ellipse. 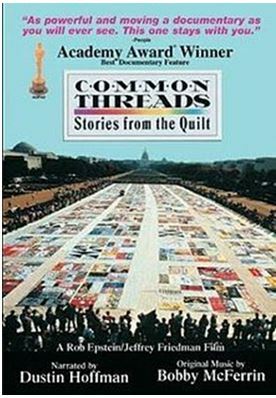 The commercial production company Films for the Humanities followed with a longer documentary in 1989, Remember My Name, relating the Quilt’s origin and illustrating the situation of Americans with AIDS through eleven individual stories. The display in New York City’s Central Park of the locally made New York Memorial Quilt, was covered in a feature program produced by WPIX-TV and hosted by Joseph Papp on June 30, 1988. Under the title Quilt of Honor : the Making of the AIDS Memorial , it presented the impact of AIDS on New York City, the making of panels to honor lives lost to the disease ( as well as letters of memory read by the bereft ) which formed the New York Memorial Quilt, and its integration into the NAMES Project. In this, it offers the New York parallel to the later accounts by Cleve Jones of the beginnings of the idea of the Quilt. And in 1989, the longest film yet made on the Project appeared, featuring narrative contributions from actor Dustin Hoffman and singer Bobby McFerrin. Using a similar structure to that used in Remember My Name, HBO Video’s Common Threads: Stories from the Quilt profiles five individuals ranging from a hemophiliac to former Olympic decathlete Dr. Tom Waddell with the intent of showing the breadth of the pandemic’s impact on the American population. It would be reissued in VHS format in 1990 and as a DVD in 2004 and 2009. The unique quality of the Quilt in the reshaped cultural landscape created by AIDS was recognized within three years of its creation by graduate level research at two universities in the American West. For her 1990 doctoral dissertation at the University of Arizona, Judith Helen Elsley chose to write on The Semiotics of Quilting: Discourse of the Marginalized, using the NAMES Quilt as one of three contemporary examples of the quilt medium as a channel for the expression of the communication of the voices of communities which do not have effective access to the traditional formats of speaking and writing. And in the same year at the University of Oregon, for her M.A. thesis in the Department of Speech, Linda Rosa Fiandaca wrote on The Role of Non-discursive Rhetoric in Legitimating a Social Movement: A Study of Metaphoric Argument in the NAMES Project AIDS Quilt. An aspect of the NAMES Project not usually considered is the correspondence from the people who poured time and thought into the designing and execution of each panel of the Quilt, as reflected in the hundreds of letters that accompanied them to the NAMES Project (and were sometimes incorporated into them as well). 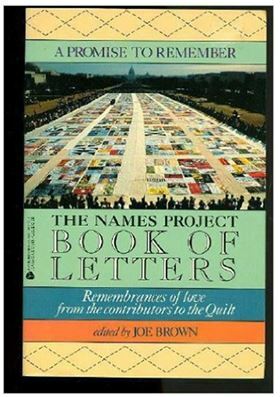 In 1992, a reporter for the Washington Post, Joe Brown, edited a collection of them, which Avon Books published under the title A Promise to Remember: The NAMES Project Book of Letters. The book also includes instructions on how to create a panel for the Quilt and messages left on the Signature Square, a blank panel where viewers of the Quilt could record their thoughts and reactions. 1992 was also the year of the International Display of the Quilt, held in occurred in Washington D.C. during the weekend of October 9-12, 1992. During that weekend, the stories of the Quilt’s origin and creators and the people remembered by its panels moved from the printed word and physical panels to the performance stage, in the form of the production Quilt: A Musical Celebration, now available on YouTube. 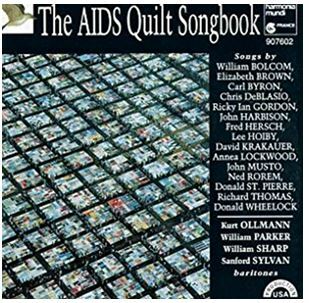 It was preceded on July 4 1992 by the premier the song cycle The AIDS Quilt Songbook in Lincoln Center’s Tully Hall in New York City. The Songbook was made of up of eighteen works written by prominent American poets and composers including Ned Rorem. 1993 saw three more dissertations and theses appear dealing with the Quilt. All were done in the Midwest, Gift Giving and Social Transformation: the AIDS Memorial Quilt As Social Movement Culture, done by Mary Elizabeth Krouse for the Department of Sociology at Ohio State University, and Fran Mindel’s The Rhetoric of AIDS Activism: A Burkean Analysis of the Names Project and ACT UP at Ohio University, and Mediated Depictions of the Personal Stories of AIDS: A Cluster Analysis by Jennifer A. Niec at Ball State. They were followed in 1994 by Motivations For and Consequences of Volunteerism: the AIDS Memorial Quilt, done as his doctoral thesis in psychology by Kevin R. Lawlor at Indiana University of Pennsylvania. 1994 also saw the production of a second short film by the NAMES Project Foundation, Voices of the Quilt: September, 1994. The academic treatment of the Quilt continued in 1995 with Mary Murray Mayo’s doctoral dissertation in sociology at Kent State, A Cultural Analysis of the Meanings in the NAMES Project AIDS Memorial Quilt. An aspect of the influence of the Quilt on mainstream religious denominations at the local level can be seen in another 1995 publication from the National Episcopal AIDS Coalition, Bringing Our Names Home : Hosting the Quilt : A Parish Response by Michael Burke. A uniquely different approach to a special group of seventy-nine Quilt panels was published in 1996 by Simon and Schuster, Always Remember: the Names Project AIDS Memorial Quilt: A Selection of Panels Created By and For International Fashion Designers showcases the panels created by name designers across the world’s fashion industry to honor friends and fellow members of the profession taken by the disease. All seventy-nine panels are reproduced in full color, and each is accompanied by a statement from its maker on the impact AIDS had on his or her life tracing how the particular form and content of their panels was conceived and evolved. Among the contributors were Gianni Versace, Yves Saint Laurent, Giorgio Armani, and Bill Blass. From October 11-13, 1996, the Quilt returned to Washington, D.C and was once more displayed on the National Mall. 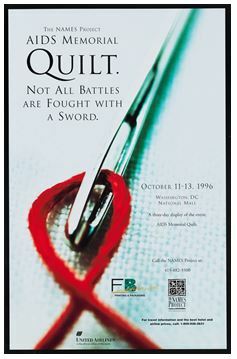 As a part of the event, a short booklet was produced, entitled Not All Battles Are Fought with a Sword: The Display of the NAMES Project AIDS Memorial Quilt, October 11-13, 1996, National Mall, Washington, D.C., Commemorative Program. A half-hour long film on the exhibition, Lest We Forget: AIDS Memorial Quilt in the Capital, Oct. 11-13, 1996, was produced by the NAMES Project Foundation and appeared in 1997. In 1997, three new graduate pieces of research were accepted at American universities dealing with the Quilt. At Washington State University, Christopher Stephen Knaus examined a less-known aspect of the Quilt’s national tours, its appearances in college and university communities, with his M.A. thesis The AIDS Memorial Quilt on a College Campus and Its Implications: An Analysis of the Effectiveness of Alternative HIV Prevention Education and Awareness Building Events. At Brandeis, Ross Ellenhorn crafted a doctoral dissertation in sociology considering the AIDS Memorial Quilt and the Modernist Sacred: Resurrection in a Secular World, while in New Hampshire Antioch University accepted Shoshana Kerewsky’s dissertation in clinical psychology on HIV+ Gay Men’s Processes of Making Their Own AIDS Memorial Quilt Panels. The function of the Quilt as a physical medium of communication continued to be a focus of analysis in 1998 at institutions as varied as Eastern Illinois University, the University of Colorado and Simmons College. At Simmons, Jani Doherty’s master’s thesis examined the Quilt in a comparative manner as Intangible Concerns, Material Means: the Vietnam Veterans Memorial and the AIDS Memorial Quilt, while the focus on the process of assembling a panel studied in the 1997 Kerewsky dissertation appeared again at Eastern Illinois University with Stephen Poole’s communication thesis on The Making of an AIDS Quilt Panel: A Burkean Pentadic Analysis .The most lengthy of the three was David F. Shaw’s doctoral dissertation at the University of Colorado, The Quilt and the Reconfiguration of Popular AIDS Discourse: A Mass Communication Perspective on the AIDS Memorial Quilt. 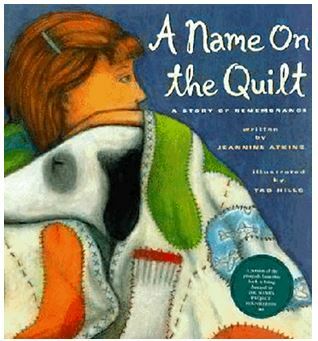 The Quilt also entered the genre of juvenile fiction in 1999 with the publication by Atheneum of Jeannine Atkins’ thoughtful and beautifully illustrated book A Name on the Quilt: A Story of Remembrance, which tells the story of a gathering of family and friends assembled to create a panel for the narrator’s uncle. The new millennium began with the appearance of the first of the two autobiographical works which would be written by Cleve Jones. 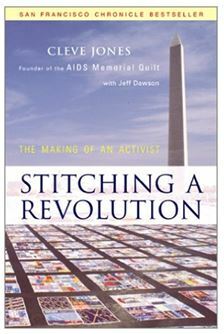 In Stitching A Revolution :The Making of an Activist , he related the story of his coming out and how he became involved in local politics in San Francisco between 1972 and 1976, working with Supervisor Harvey Milk and Mayor George Moscone and the history of the Quilt from concept to its first displays and national tours. He also provides a timeline of Quilt history and instructions for creating a memorial panel. The book was reprinted in 2001 and 2002, and in the latter year an article by Christopher Capozzola appeared in the winter issue of Radical History Review on “ A Very American Epidemic: Memory Politics and Identity Politics in the AIDS Memorial Quilt, 1985-1993.” Graduate research on the Quilt as an instrument of communication continued in 2003 with Nevada gay civil rights advocate Daniel Hinkley’s M.A, thesis at the University of Nevada, Las Vegas, and Names Project AIDS Memorial Quilt: A Rhetorical Study of the Transformation of an Epidemic through Social Movement. Hinkley was himself a person living with AIDS and as part of his research interviewed four Quilt project staff and volunteers. A longer dissertation in art education done at Pennsylvania State University in 2005,by Ronald Aman, It’s All About Love : Gert McMullin and the Names Project Aids Memorial Quilt , takes as its point of departure one of the San Francisco artists who was involved with the Quilt from its earliest days and explores the varied ways in which it can be read, as an art project embraced and speaking for an entire community, a vivid yet silent political statement that demands response, and as a memorial to lost individuals. A significant event marking the impact the Quilt had had on the American society since its creation also occurred in 2005, when the Quilt was awarded of the “ Save America’s Treasures “ federal grant. By this action, the Quilt was recognized ) as the NAMES Project website states , as being “‘part of America’s priceless historic legacy, an enduring symbol that defines us as a nation and is an important component of our culture and heritage that helps to explain America’s past to future generations. “ http://www.aidsquilt.org/about/the-names-project-foundation. The grant provided a matching grant of $100,000 which was used to establish a conservation program to ensure the Quilt’s long-term survival. The first documentary to be done on the Quilt since 1989 aired in 2015, by this time, the Quilt had grown so immense that it would have stretched for over fifty miles if all the panels could have been assembled together. The title of The Last One: Unfolding the AIDS Memorial Quilt refers to the desire of the participants to be able to sew on the last panel marking the end of the pandemic. The contents of the film include interviews with activists, archival footage on the Quilt’s first three decades, and personal reflections from the individuals engaged in the ongoing process of designing and creating new panels. And in 2016, Cleve Jones wrote a second autobiography, When We Rise: My Life in the Movement, which gives more of his history in the counterculture and activist communities than is included in its 2000 predecessor Stitching A Revolution and enables readers to evaluate his perspectives on the Quilt as it entered its fourth decade. From a wall of signs in San Francisco to huge a diverse displays on the National Mall and across the country, the NAMES Quilt has evolved into a living memorial to a thread of LGBT history that cannot be and must not be forgotten. Always Remember: the Names Project AIDS Memorial Quilt: A Selection of Panels Created By and For International Fashion Designers. New York: Simon & Schuster, 1996. Aman, Ronald A. It’s All About Love: Gert McMullin and the Names Project Aids Memorial Quilt. Ph. D. dissertation (Art Education), Pennsylvania State University; 2005. Atkins, Jeanine. A Name on the Quilt: A Story of Remembrance, New York: Atheneum Books for Young Readers, 1999. Burke, Michael. Bringing Our Names Home: Hosting the Quilt: A Parish Response. Washington, D.C.: National Episcopal AIDS Coalition, 1995. Capozzola, Christopher. “A Very American Epidemic: Memory Politics and Identity Politics in the AIDS Memorial Quilt, 1985-1993.” Radical History Review. Winter 2002: 91-109. Common Threads: Stories from the Quilt. New York: HBO Video, 1989. Davis, Warren A. The Personal versus the Political: the United States Holocaust Memorial Museum and the Names Project Memorial AIDS Quilt in the 80s and early-90s. M.A thesis, De Paul University, 2009. Doherty, Jani. Intangible Concerns, Material Means: the Vietnam Veterans Memorial and the AIDS Memorial Quilt. M.A. thesis, Simmons College, 1998. Ellenhorn, Ross, The AIDS Memorial Quilt and the Modernist Sacred: Resurrection in a Secular World. Ph.D. dissertation, Department of Sociology. Brandeis, 1997. Elsley, Judith Helen. The Semiotics of Quilting: Discourse of the Marginalized. Ph.D. dissertation, University of Arizona, 1990. Fiandaca Linda Rosa. The Role of Non-discursive Rhetoric in Legitimating a Social Movement: A Study of Metaphoric Argument in the NAMES Project AIDS Quilt. University of Oregon, M.A. thesis, Department of Speech, 1990. Freedman, Deborah Eve. Names Project AIDS Memorial Quilt: Stories from Maine. Rockland, Maine: Maine Authors Publishing, 2013. Jones, Cleve, Stitching a Revolution: The Making of an Activist. San Francisco: HarperSanFrancisco, 2000. 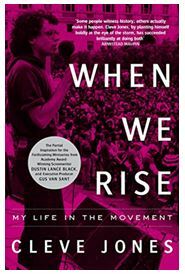 Jones, Cleve, When We Rise: My Life in the Movement. 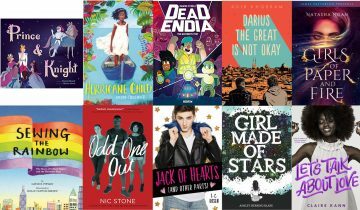 New York: Hachette Books, 2016. Kerewsky, Shoshana. HIV+ Gay Men’s Processes of Making Their Own AIDS Memorial Quilt Panels. Ph.D. dissertation, (Clinical Psychology) Antioch University, 1997. Knaus, Christopher Stephen. The AIDS Memorial Quilt on a College Campus and Its Implications: An Analysis of the Effectiveness of Alternative HIV Prevention Education and Awareness Building Events. M.A. thesis, Washington State University 1997. Krouse, Mary Elizabeth., Gift Giving and Social Transformation: the AIDS Memorial Quilt as Social Movement Culture. Ph.D. dissertation, Ohio State University, 1993. 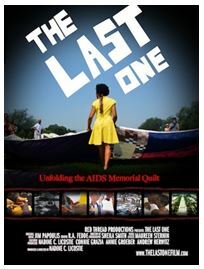 The Last One: Unfolding the AIDS Memorial Quilt. Red Thread Productions, 2015. Lawlor, Kevin R. Motivations For and Consequences of Volunteerism: the AIDS Memorial Quilt. Ph.D. thesis, Indiana University of Pennsylvania, 1994. Leonard, Robert. Representation, Identification, and Meaning Making: A Symbolic Interaction Analysis of Visiting the NAMES Project AIDS Memorial Quilt. Ph.D. dissertation (Communications) University of Utah 2006. Lest We Forget: AIDS Memorial Quilt in the Capital, Oct. 11-13, 1996, San Francisco, California: NAMES Project Foundation, 1997. Loevy, Katharine Denise. The NAMES Project AIDS Memorial Quilt: Visibility, Sexuality, Mourning. Thesis (M.A thesis (History of Art), Vanderbilt University, 2011. Mayo, Mary Murray. A Cultural Analysis of the Meanings in the NAMES Project AIDS Memorial Quilt. PhD dissertation, Department of Sociology, Kent State University, 1995. Mindel, Fran. The Rhetoric of AIDS Activism: A Burkean Analysis of the Names Project and ACT UP .Ph.D. dissertation , Department of Communication, Ohio University, 1993. Not All Battles Are Fought With a Sword: The Display of the NAMES Project AIDS Memorial Quilt, October 11-13, 1996, National Mall, Washington, D.C., Commemorative Program. 1996. Niec, Jennifer A. Mediated Depictions of the Personal Stories of AIDS: A Cluster Analysis Ph.D. dissertation. .Ball State University, 1993. Poole, Stephen. The Making of an AIDS Quilt Panel: A Burkean Pentadic Analysis. Eastern Illinois University, 1998. A Promise To Remember: The NAMES Project Book of Letters edited by Joe Brown. New York: Avon Books, 1992. Quilt of Honor: The Making of the AIDS Memorial. New York: WPIX-TV, June 30, 1988. Hosted by Joseph Papp. Remember My Name. Princeton, New Jersey: Films for the Humanities, 1989. Ruskin, Cindy and Matt Herron. The Quilt: Stories from the NAMES Project. New York: Pocket Books, 1988. Shaw, David F. The Quilt and the Reconfiguration of Popular AIDS Discourse: A Mass Communication Perspective on the AIDS Memorial Quilt. Ph.D. dissertation, University of Colorado, 1998. Voices of the Quilt: September 1994.San Francisco, California: NAMES Project Foundation, 1994. We Bring A Quilt. San Francisco, California: NAMES Project Foundation, 1988.